The hotel offers a restaurant. A bar/lounge is on site where guests can unwind with a drink. Guests can enjoy a complimentary breakfast. Wired and wireless Internet access is complimentary. Business-related amenities at this 4-star property consist of a 24-hour business center and limo/town car service. Event facilities measure 0 square feet (0 square meters). This business-friendly hotel also offers a 24-hour fitness center, spa services, and tour/ticket assistance. Parking is available onsite for a surcharge. Hotel Le Germain Montreal is a smoke-free property. 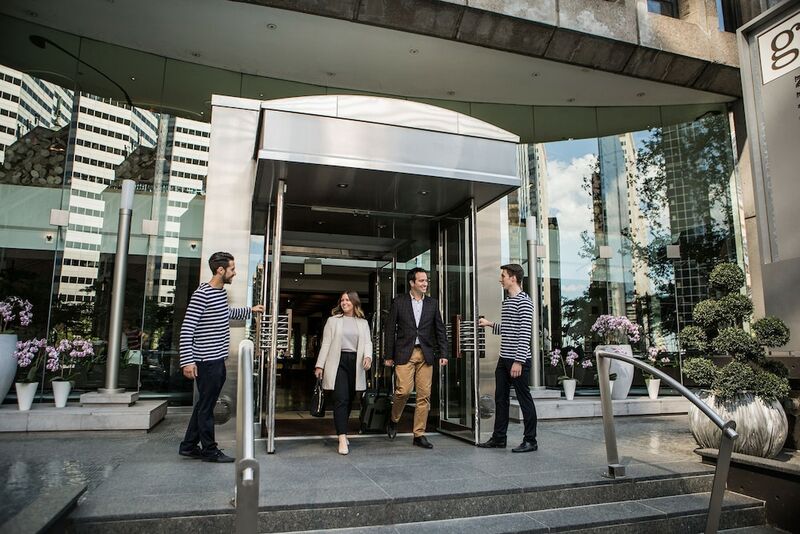 Located in Ville-Marie, this romantic hotel is steps from Les Cours Mont-Royal, The Underground City, and Sainte-Catherine Street. McGill University and Montreal Museum of Fine Arts are also within 10 minutes. Peel Station and McGill Station are within a 5-minute walk. This smoke-free hotel features a restaurant, a 24-hour fitness center, and a bar/lounge. Free continental breakfast and free WiFi in public areas are also provided. Other amenities include a 24-hour business center, valet parking, and coffee/tea in a common area. All 101 soundproofed rooms provide free WiFi, free wired Internet, and pillowtop beds. Comforts include Egyptian cotton sheets and down comforters, and guests will also appreciate thoughtful touches like espresso makers and bathrobes. This property is closed from 16 October 2018 to 01 September 2019 (dates subject to change). Hotel Le Germain Montreal offers 101 air-conditioned accommodations with iPod docking stations and minibars. Each accommodation is individually furnished and decorated. Pillowtop beds feature Egyptian cotton sheets, down comforters, and premium bedding. 42-inch LCD televisions come with premium cable channels and pay movies. Bathrooms include shower/tub combinations, bathrobes, designer toiletries, and hair dryers. Guests can surf the web using the complimentary wired and wireless Internet access. Business-friendly amenities include desks, complimentary newspapers, and phones. Additionally, rooms include laptop-compatible safes and espresso makers. In-room massages and hypo-allergenic bedding can be requested. Housekeeping is provided daily. Laurie Raphael - This restaurant specializes in local cuisine and serves breakfast, lunch, and dinner.